The role involves checking tickets, catching fare dodgers, issuing fines and giving guidance to travellers. More than 620 people have applied for 52 jobs as a ticket inspector on Edinburgh’s trams. The Ticketing Service Assistants (TSA) will check tickets, catch fare dodgers, issue fines and give guidance to travellers when the tram network goes live. The £17,000-a-year clippies will be trained in conflict management to deal with trouble-making passengers. Tom Norris, Edinburgh Trams general manager, said: "I'm delighted with both the number and standard of applicants we're received in our attempts to find the best possible TSA's for Edinburgh Trams. "This is a chance to be a part of Edinburgh's history, to be able to say you were part of the team when trams returned to the streets of Edinburgh. 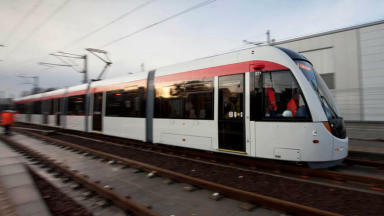 "The opportunity to apply still exists and we continue to welcome potential applicants who feel they can add to our team and be part of an exciting future for Edinburgh Trams and transport in the city. We continue to advertise both full-time and part-time positions on our website." Around 130 staff including drivers, controllers and administrative staff will work in a variety of different roles within the tram system throughout the city. The service got 1336 applicants for 57 tram driver and controller jobs earlier this year. Lesley Hinds, the city's transport convener, said: "We need a whole team to help ensure the smooth running of the new tram service and TSAs will play a vital part in this. "They will be the face of the service, dealing directly with the public on a daily basis, and so we're looking for personable, professional people who will help us to deliver an efficient and customer focused tram service for Edinburgh." The successful candidates will initially be required to undergo a period of comprehensive training to prepare for the launch. The closing date for applications is November 25.